Biography: Christian Rural Evangelical Foundation Ministries was founded in 2002 to reach out to the rural areas of Uganda which lack benefits such as health services, roads, clean water and education. They are also reaching out evangelically to Kenya, Rwanda, Sudan, Burundi and Democratic Republic of Congo. The mission of CREF is to make Christ known to the whole world by reaching out to the lost, winning them to Christ, teaching them to obey Christ, developing them into mature Christians, and ministering to their needs. The leadership team consists of called, qualified and well-equipped people in the fields of theology, sociology, education, finances and leadership managerial skills. Joshua and Grace also pastor Kayango Hill View Baptist Church which has a focus on evangelism and church planting, discipleship, leadership training, relief ministry, women, youth, children and prayer ministries. 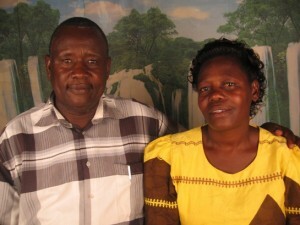 Because of the culture in their area they have separate cell groups during the week for men, women, youth and children. They have a very large children's ministry of well over 1200 children including a feeding program for orphaned children. Their youth ministry is very active and meets for Bible study and camping as well as going to villages to assist the elderly in constructing shelters, fetching water and firewood and working for them in their gardens. Strengths: Joshua is a gifted administrator with the ability to see and meet needs with a loving heart. Joshua and Grace also have an adult son, David.